The Fichu is finally finished and blocked!! When I started it I thought it was going to be an easy project. Well, I was wrong. It took me a while to get it but once I did... everything went just smooth and fine. * Book: Victorian Lace Today. 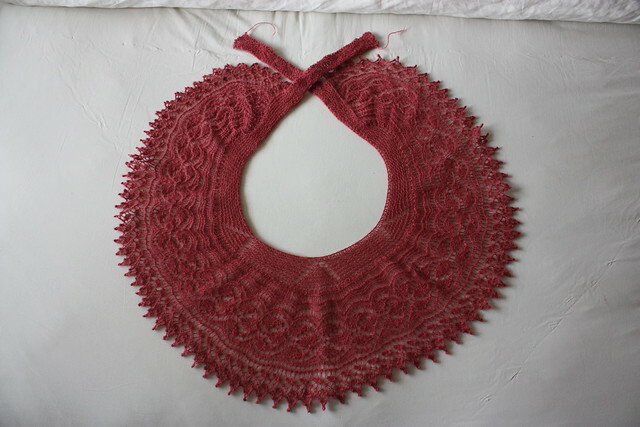 * Yarn: Einband (Icelandic lace). Pattern detail: I would say that these are flowers, aren't they? * How to make a picot edge. Picot edge detail against the light. 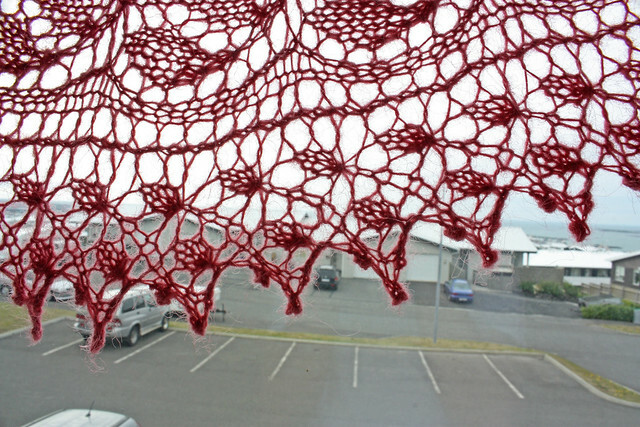 * Attatching the lace section to the band making joins along live stitches that lay perpendicularly to the direction of knitting (wow this sounds weird!). Look at this diagram I draw to (maybe) understand the idea a little bit better. The joins look actually really good. They are very even and somehow invisible. * First of all, to understand the pattern and the construction of the Fichu (Diagram). 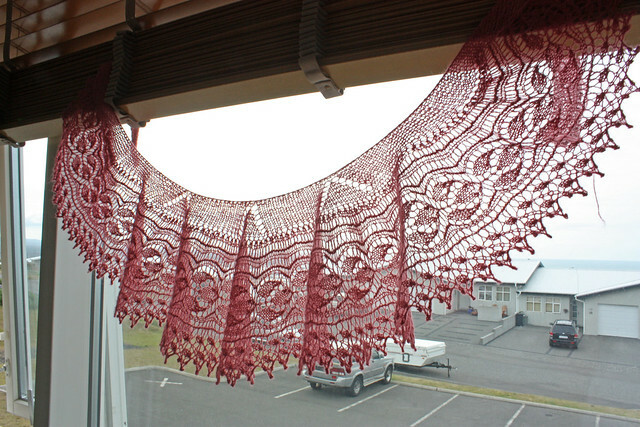 * Blocking: This is the first rounded lace project that I knit and blocking it was a real challenge. The challenge was to have it even and nicely rounded and well proportioned. It took me over an hour to get it done (and a lot of sweating and pain in the knees and back!). I started by pinning the inner circle trying to have as rounded as possible.Then I put one pin in each picot trying to stretch it evenly. After having the outer circumference all pinned I just removed the inner pins... they were no longer necessary. I think that the time, sweat and pain definetely paid off! 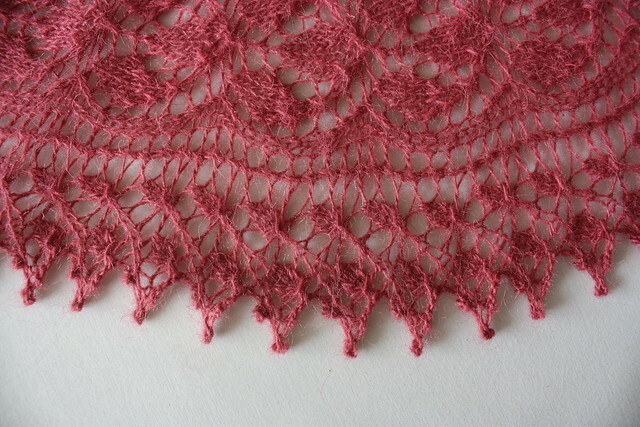 Final thoughts: It was really nice to knit this piece even though all the difficulties (from which I learned a few new things :) The Fichu is very light and airy and the lace pattern is just beautiful. If you have the book... definetely give it a try! Hey Christa! You are awefully generous with your words! Thank you so much for that! Madre mía, es una preciosidaddddddddd. Muy muy muy muy muy muy bonito. Te ha quedado precioso y si sienta tan bien como a la modelo de la foto, mejor todavía. ¡¡¡Eres un artista!!!. I have knitted for years, but nothing so beautiful and well done as your fichu. Also, It sounds stupid, but I don't know how to block. Once it is blocked, what do you do? Do you iron the garment lightly? You are an inspiration! Keep on knitting and posting about it. Muchas gracias a todos/as por los comentarios :) Estoy muy contento con cómo resulto este fichu (y estoy con ganas de hacer otro pronto!). I can wait to try it. I must rush and finish some of my UFOs. !!!! !Es impresionante como quedan las ondas en la caida del tejido!!!!! Finally have a moment to write a comment, though I don't know if you'll catch it since you've already moved on to your next post/project. Will say, anyway, that as usual, I am impressed - no, overwhelmed - with another work of art from your hands!! 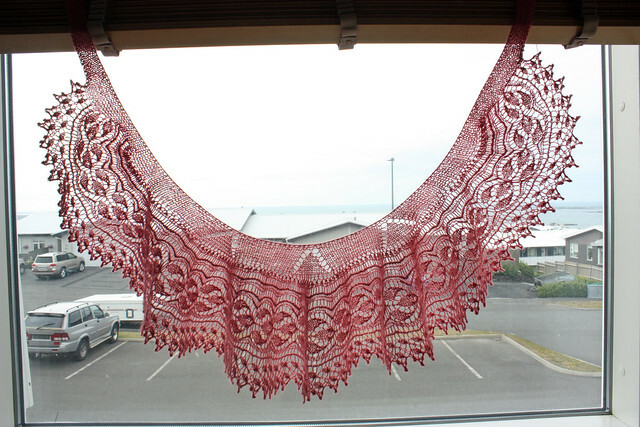 This shawl is truly gorgeous! Hanging in the window like that with the light behind it shows all the beautiful stitches so well. 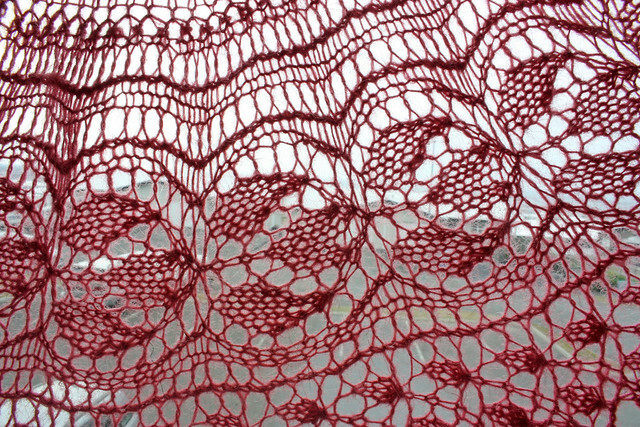 The close-up photos made me think of your bobbin lace and how amazingly alike they look. You truly are a very special friend when you are willing to spend all the time and effort that you did on this and then give it away! Hey Judi! Of course that catch your comment! How wouldn't I!? Thank you so much for your kind and generous words. 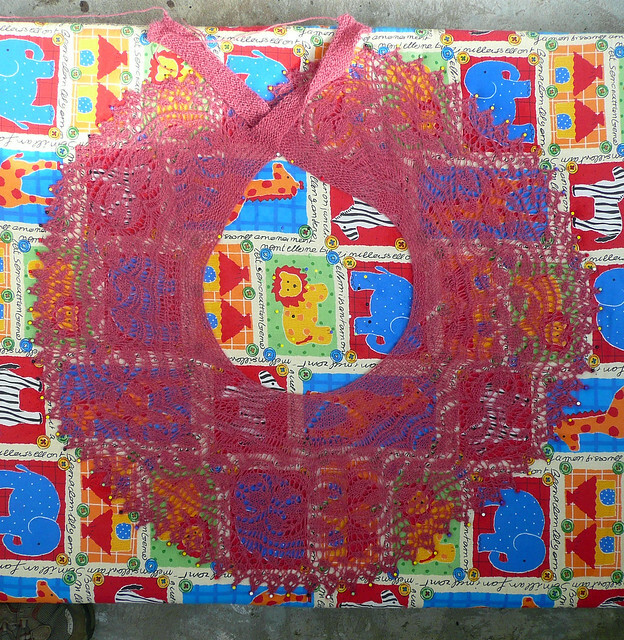 Don't you find that there is something kind of royal about this pattern? 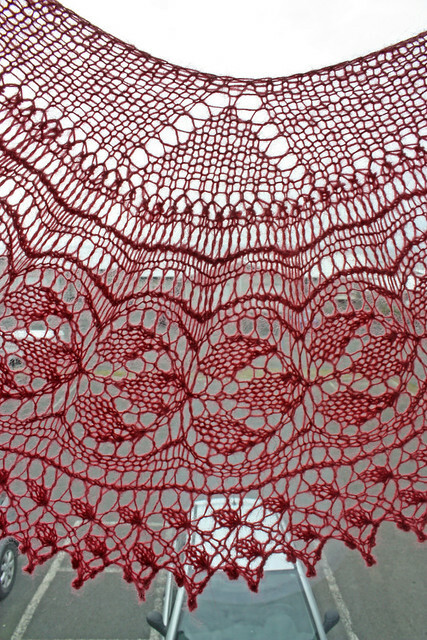 I really like it a lot, especially the picot border. It looks very special. And it is pink! I never thought I would ever knit something pink... I am not at all into pink but I have been looking at pink yarn a lot lately!